update (04 Dec 2014): The Gross Barmen Hot Springs Resort has been officially reopened on 03 December 2014! Post by Namibia Wildlife Resorts (Pty) Ltd.
update (13 Oct 2014): The Gross Barmen Hot Springs Resort is now scheduled to be reopened to the public on 01 December 2014 by the first week of December 2014 after undergoing extensive renovations. The Gross Barmen Hot Springs Resort, located about 100km north of Windhoek and 25km from Okahandja, is set to re-open sooner than or by August 2014. The new accommodation facilites are already completed, while work on the swimming pool, conference centre and restaurant is nearing completion. Only the work on the new spa, the restaurant as well as the reception areas is currently delayed. The resort, which is managed by state-owned Namibia Wildlife Resorts (NWR), has been closed for redevelopment since Novemer 2010. Javier Campllonch and his wife recently went on a road trip through South Africa. They started in Johannesburg, took a tour through Kruger National Park, hiked in the Drakensberg Mountains, drove through the Transkei, along the Sunshine Coast and the Garden Route and finally finished their trip in Cape Town. Luckily for us Javier filmed their trip and uploded the video to vimeo. Sit back, put your headphones on (does anyone know the song? ), switch the video to full screen, press play and enjoy! Kudos Javier, we really love your film! South Africa Road Trip from Javier Campllonch on Vimeo. 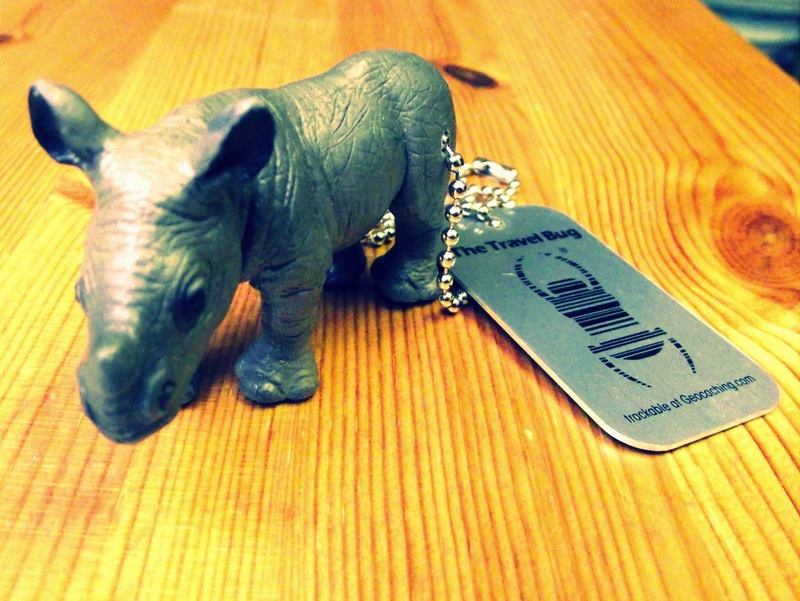 Our travel bug "little umkhombo" wants to explore South Africa! To all geocachers out there: Our travel bug "little umkhombo" (TB552KW) started his journey of a lifetime in North Rhine-Westphalia (Germany) in May 2013. In the meantime he travelled all over Germany, visited Croatia, Bosnia & Herzegovina, Switzerland, France and Rwanda before he finally arrived in South Africa. 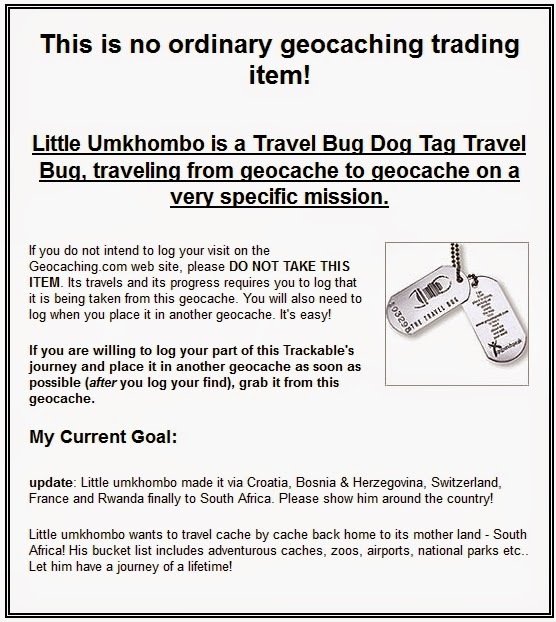 Please show him around the country and take him to the greatest geocaches! THX! Table Mountain National Park (TMNP), located in Cape Town, celebrates its 16th anniversary on 01 May 2014. As part of the celebration all South Africans will have free access to the Oudekraal, Perdekloof, Silvermine and Newlands Forest picnic and braai sites on Workers' Day. 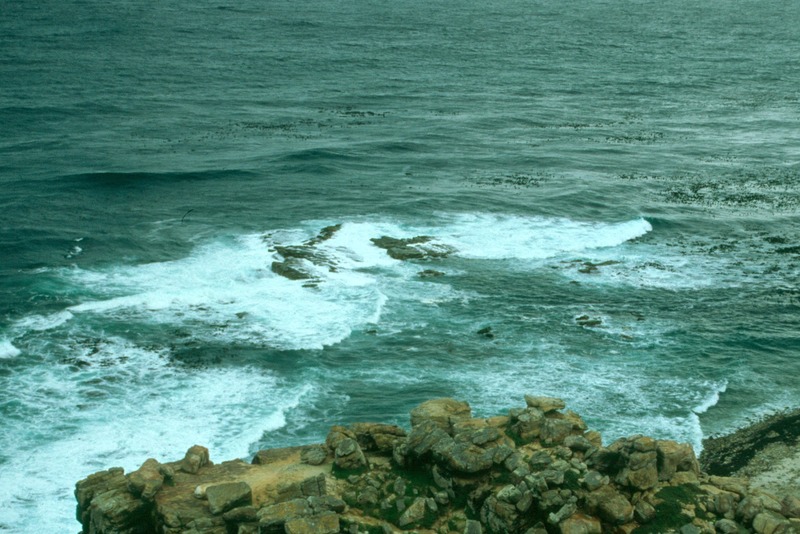 The Cape of Good Hope (Cape Point), Boulders Penguin Colony and Tokai Forest picnic site are excluded from the free entry offer. Entry into the park will be limited to the amount of visitors TMNP can accommodate; commercial operators and their clients are excluded from this offer. To gain free access to Table Mountain National Park visitors must bring along their green bar-coded South African ID. 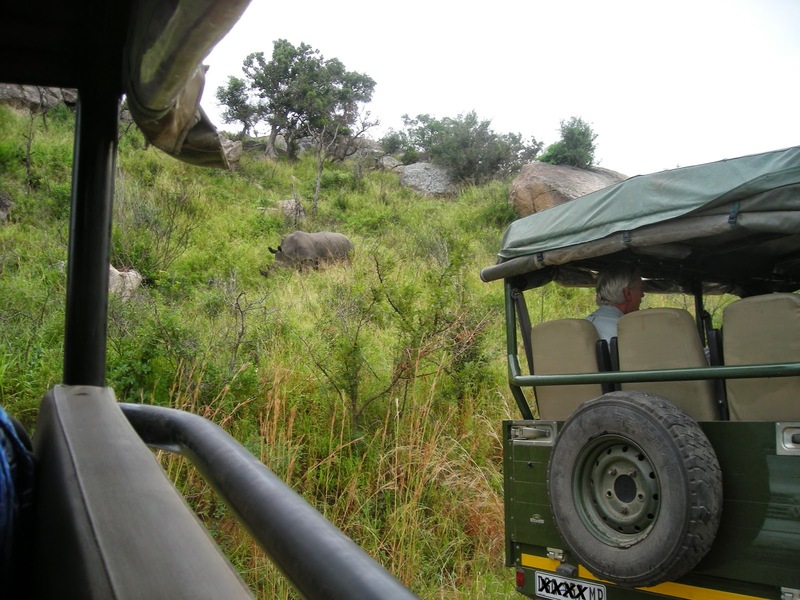 South African National Parks (SANParks) announced in October 2013 that some restaurants and take-aways in some of Kruger National Park's rest camps will get new operators. Just before Easter 2014 (17 April 2014), SANParks issued a new update on the restaurant refurbishment plan. A Boskombuis (bush kitchen) is planned to be operational from 20 May 2014 to 21 June 2014 and will provide a unique dining experience with limited menu. At this stage there will be no temporary dining option from 07 - 20 May 2014, in this camp. Debonairs opened on 15 April 2014. Mugg and Bean on the Move opened on 17 April 2014. Cape Town in South Africa is known to be one of the best windsurfing spots in the world. Especially during the European winter (November - February) windsurfers from the North are coming down to the Mother City to surf the waves of Big Bay, Langebaan and The Lake. Fanatic, a windsurfing brand from Munich (Germany), and Enjoy the Soup (check out "TIA") recently teamed up to produce a short film summing up how crazy the surf action in Cape Town during those month can be, how windsurfing pros spend their days at the Southern tip of Africa and what else Cape Town has to offer! Enjoy "From Cape Town with Love" and kudos to Fanatic, Enjoy the Soup as well as to the surfers Klaas Voget, Max Matissek, Max Rowe, Alessio Stillrich and Adrien Bosson! Namibia's flag carrier, Air Namibia, and Turkish Airlines, the national airline of Turkey, have signed a Memorandum of Understanding (MoU) on 11 March 2014. Through the MoU, the two airlines seek to enhance commercial cooperation and air traffic for passengers and cargo between Namibia and Turkey, to facilitate human capital development and training, coordinated network development, strengthen operating and technical capabilities of Air Namibia as well as an overall improvement of Air Namibia's service standards and efficiency levels. We just got information from the Tanzania-Zambia Railway Authority (TAZARA) that the Dar es Salaam-bound Kilimanjaro Ordinary Passenger Train that was scheduled to depart New Kapiri Mposhi in Zambia on 18 April 2014 at 14:00hrs CAT has been canceled due to the closure of the main line in Tanzania following various incidences that have affected operations. all the train stocks are currently in Tanzania, with one of the stocks being blocked in Dar es Salaam where a Heavy Motor Trolley derailed on Tuesday 15th April 2014 thereby blocking the line. In the last two weeks, heavy rains in Dar es Salaam have wrecked havoc, causing one major wash-away that dismantled the soil formation and left 40 metres of the rail hanging about 2.4 kilometres from the Port of Dar es Salaam as well as a major landslide affecting about 25 metres of the track, 36 kilometres from Dar es Salaam. In Tanzania, the Mukuba Passenger Train that was scheduled to depart on 15 April 2014 was eventually cancelled following delays emanating from the landslide and track blockage that resulted from the derailment of the Motor Trolley that was servicing the landslide site. Rescue operations are currently in progress at all sites and normal operations are expected to resume by 21 April 2014. The next express passenger trains will therefore depart simultaneously from Dar Es Salaam and New Kapiri Mposhi next Tuesday (22 April 2014), while the next ordinary passenger trains will depart simultaneously next Friday (25 April 2014) from Dar Es Salaam and New Kapiri Mposhi. According to the latest statistics released by the Department of Environmental Affairs, South Africa has lost 294 rhinos to illegal poaching since the beginning of 2014. Of the rhinos poached, 185 rhinos were killed in the Kruger National Park, 34 in Limpopo, 26 in the North West, 25 in KwaZulu Natal, 10 in Mpumalanga, 9 in the Eastern Cape, 4 in the Free State and 1 in the Western Cape. The total of 93 alleged poachers have been arrested in South Africa so far in 2014. South African carrier SA Express suspends two of its regional routes. From 15 May 2014 the airline discontinues to serves its routes between Cape Town and Maputo (Mozambique) as well as between Cape Town and Windhoek (Namibia). Travellers who are booked on flights after 15 May 2014 are advised to contact the airline. They will get a full refund or will get booked on partner airlines servicing Maputo or Windhoek. 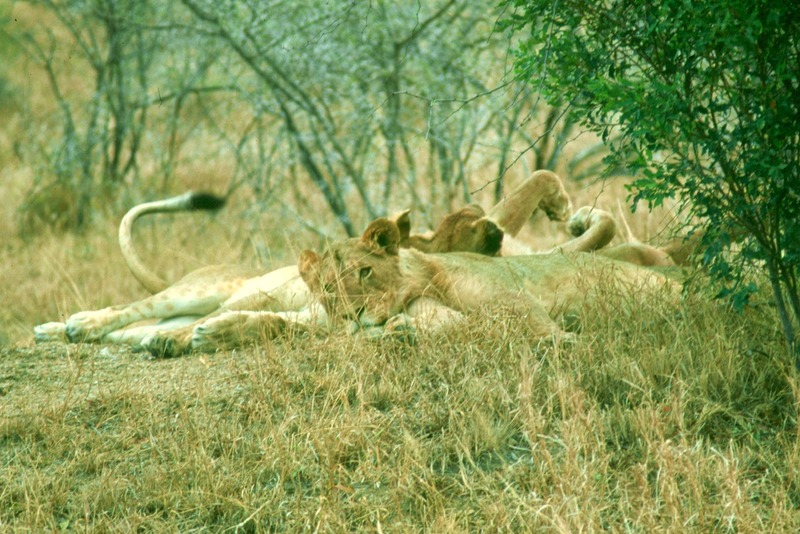 Travellers planning to visit Kruger National Park between 17 - 21 April 2014 (Easter) should keep in mind that South African National Parks (SANParks) will strictly enforce qate quotes during that period. SANParks therefore advises day visitors to book in advance in order to secure their entry in the park. Day visitors who pre-book their visit are expected to pay a non-refundable deposit of R32 per adult and R16 per child to secure the space so that they can be counted in the number that makes a daily quota at that particular gate. The Sterkfontein Caves, located in the Cradle of Humankind World Heritage Site about 50km northwest of Johannesburg, are open to visitors again since 08 April 2014. The caves were recently closed to the public for routine stability tests, which are undertaken every five years to determine the safety of the tourist attraction. The Sterkfontein Caves are set of limestone caves where many hominid and other animal fossils, dating back more than 4-million years, have been found over the last few decades. The caves are open to the public from 09h00 to 17h00 every day. Namibia's flag carrier, Air Namibia, will suspends its flights between Windhoek and Accra in Ghana from 26 June 2014. According to the airline, limited traffic numbers are a major reason for the termination of the route. Passengers booked on a flight beyond the termination date are advised to contact Air Namibia to get booked on partner airlines servicing Accra. Just a quick reminder: Daylight saving time ended in Namibia already on the first Sunday in April, which happend to be the 06 April 2014. Time changed from UTC+2 to UTC+1. The official time change took place at 02:00am (from 02:00am to 01:00am). Daylight saving time in Namibia will resume again on the first Sunday in September 2014 (07 Sept 2013). Time does not change in the Zambezi Region (until 2013 known as the Caprivi Region) in Namibia's north, as this area is not subject to summer and winter time changes. South African low-cost carrier Kulula and Kenya's flag carrier, Kenya Airways, have signed a bilateral codeshare agreement. Under the agreement, Kulula places its code (MN) on all of Kenya Airways' daily services between Johannesburg and Nairobi, while Kenya Airways places its code (KQ) on all South African domestic routes currently serviced by Kulula, including Cape Town, Durban, George and East London. Bookings are available for sale from today (10 April 2014). 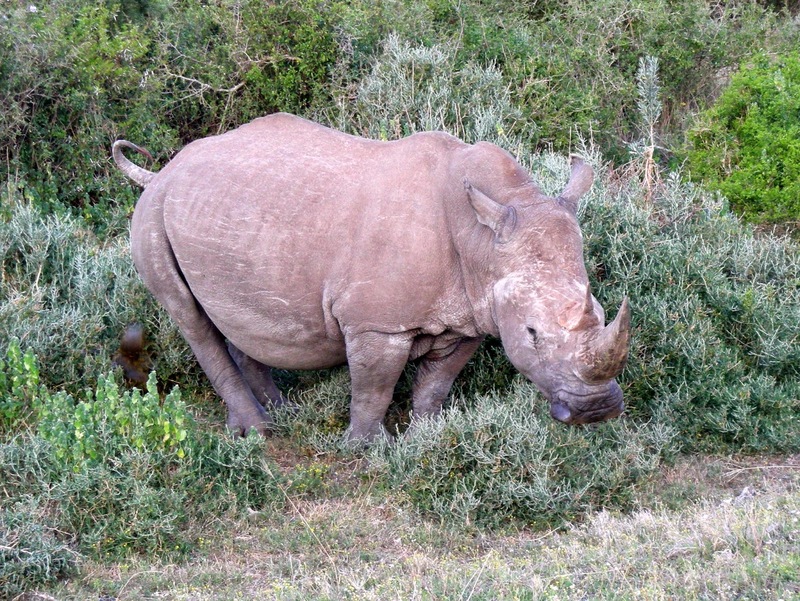 According to the latest statistics released by the Department of Environmental Affairs, South Africa has lost 277 rhinos to illegal poaching since the beginning of 2014. Of the rhinos poached, 166 rhinos were killed in the Kruger National Park, 34 in Limpopo, 32 in the North West, 24 in KwaZulu Natal, 10 in Mpumalanga, 6 in the Eastern Cape, 4 in the Free State and 1 in the Western Cape. The total of 86 alleged poachers have been arrested in South Africa so far in 2014. Airports Company South Africa (ACSA) has published the on-time performance results of domestic airlines’ flying out of OR Tambo in Johannesburg, Cape Town International Airport, and Durban's King Shaka International Airport in March 2014.